Welcome to the update for 2015 Creekside Gospel Music Convention! Can you believe that Creekside is only Seven months away? We hope that you are including this great event in your vacation plans for this year. 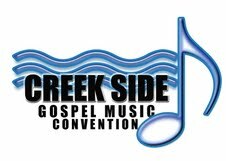 Creekside runs from November 2nd through November 5th at the Smoky Mountain Convention Center in Pigeon Forge, Tennessee. There will be lots of music, fellowship, fun and food! Creekside annual events include the Lou Hildreth Honors on Monday night. This past year, Lou Hildreth honored Willie Wynn. In 2015, the honoree will be…but I can’t tell you yet because it’s a secret! Stay tuned to this page for more information! The Diamond Awards take place on Tuesday night with many special guests. See below for the Road to the 2015 Diamond Awards. Other events include showcases and an evening of choir singing. New for 2014 was the evening Midnight Prayer. This is sure to be repeated in 2015! Perhaps even the Great Doughnut Caper…again, check back here for the latest information. Creekside artists will be performing every night, as well as in showcases during the day. For more information on Creekside including ticket information, click on to www.creeksidegospelmusicconvention.com or to the Facebook page at www.facebook.com/Creeksidegospelmusicconvention . Are you interested in volunteering at Creekside? We would love to have your help! If you can’t be there, we can even use your assistance prior to the event. Please email Rob Patz at rob@sgnscoops.com. Artists interested in being a part of Creekside 2015, please email Rob Patz at rob@sgnscoops.com or call 306-920-4057. We are traveling the Road to the 2015 Diamond Awards during this nomination period, by highlighting the definition of each award category on the SGN Scoops website. Be sure to visit the website at www.sgnscoops.com regularly to see the latest posting on this series. We outline who is eligible for each award and also tell you who the 2014 winner was for that category. After March 31, the list of nominees will be posted on the site and fans will then nominate their favorites from this list, with a maximum of five names nominated per award. In this way, the field of nominees will be narrowed to 10, voted on by fans once more and then narrowed to five. This final list of five will then be voted on by fans to find the one winner for each award. You can vote soon on the Diamond Awards Top Ten! Keep watching for the Top Ten announcements. The 2015 Diamond Awards Nominations can be found at www.sgnscoops.com/2015-diamond-awards. The Diamond Awards are hosted by SGN Scoops digital magazine and Coastal Media Group. We hope to see you at the 2015 Creekside Gospel Music Convention in Pigeon Forge!